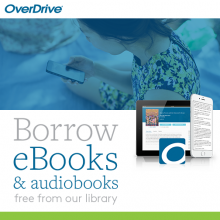 If you read eBooks or audiobooks using Overdrive, then there are some changes underway. Until recently, each public library in Westchester had its own Overdrive account. So too did the Westchester Library System (WLS). So if you were a White Plains cardholder, and were searching for a title, you had to check both our White Plains account and the WLS account. This week, the Overdrive collections from the 38 public libraries in Westchester, along with the WLS collection, have come together to share our digital books and become, effectively, one collection. Why is this a good thing? It means that White Plains cardholders now have access to over 40,000 titles—a huge collection. It also means that you only have to search one collection. At the same time, you aren’t losing any of your privileges as a White Plains cardholder. For popular titles that we have purchased, which typically have holds on them, you will have access to a copy before other cardholders. In this way, our digital collection will work just like our print collection: we will share the material not in use, but copies of high interest books will be used to fill requests from White Plains cardholders. If you access Overdrive through a computer, then the transition should be unnoticeable. If you use the Overdrive app or their newer app, Libby (which I strongly recommend! ), then you will need to make the Westchester Library System your home library. Need help? Call us at 422-1480.